So begins the U.S. Administration's description of the World Economic Forum, which President Trump Addressed on January 26, 2018. That description (along with the image chosen for it, reproduced above) was itself a window of the world view that infuses current U.S. approaches to globalization and global trade. For much of the tenure of the 45th President, there has been much criticism and little explanation of the emerging U.S. approaches to global trade and the principles on which it will be operationalized. There is a growing chasm between business and the intelligentsia, however, on its potential. What follows are the Remarks by President Trump and President Berset of the Swiss Confederation Before Bilateral Meeting, posted to the White House Website, and the Full text: Trump Davos speech transcript that was reproduced by Politico. Also included is the Background Briefing given by a "Senior Administration Official" and also posted to the White House Website. All are worth considering carefully. They suggest a development of the new American position on trade that appears to affirm that the American Administration has come to believe that the U.S: has entered into a new historical stage and is developing U.S. principles and engagement for this "New Era" of global engagement. PRESIDENT BERSET: So I want to welcome President Trump and his delegation here to Davos. 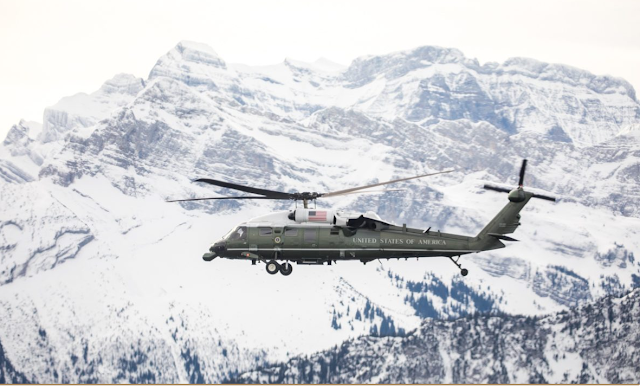 It’s the first time that President Trump visits Davos and Switzerland. And it has been 18 years since the last visit from a U.S. President here. And we appreciate the significance of the gesture, Mr. President. Thank you for being here. Thank you for being here. PRESIDENT BERSET: You chose to come to Davos, one of the most important, most significant international meeting we host in Switzerland. And you are also always welcome to Geneva, Mr. President, where major global decisions and deals are cut every day. Switzerland and the U.S. — that’s a longstanding, excellent relationship. We share a deep, historic commitment to freedom, to democracy, to human rights, to free markets. And there is one more point I want to highlight to you, one aspect: our mutual economic footprints. We have very strong economic relations. They are very strong, and they are growing very fastly. This is really interesting: More than 500 Swiss firms in United States and more than 3,500 business locations with a (inaudible) — creation of a half a million jobs. And I think, I believe, we can even deepen these relations to strengthen our economies, and to build up, together, solutions to global issues. So once again, welcome. Thank you for being here, and I look forward to a good discussion. Mr. President, it is a great honor to be with you. Davos has been exciting. And in addition to that, I think we’re bringing a lot of things back to our country, including tremendous goodwill. I yesterday and last night — dinner with some of the great business leaders of the world, as you know. And it was very interesting to see and hear. They’re very happy with what’s happening in the United States. We’re setting records every day. We’re setting records, and we’re going to continue to set records. We actually — believe it or not, we have a long way to go. We have a lot of upside. Tremendous — we have a tremendous margin up. And a lot of people are saying, “Well, we’ve gone up a lot, but can you go up?” We really have a tremendous — I think we have a long way to go. We’ve cut regulations, we’ve passed the tax bill, the likes of which our country has never seen. Included in that bill is ANWR. A tremendous potential in ANWR, in Alaska. You know, that’s a part of the bill which people don’t even talk about. They’ve been trying to get ANWR approved since the start of Reagan — President Reagan — and we got that. And the individual mandate, which is — essentially, it’s a — at least a partial, but a pretty good repeal of Obamacare. It was a very important thing that we got that. But we got the biggest tax cuts in the history of our country, and we also have major tax reform. It’s had a tremendous impact on our country. You see it, and everybody sees it. And Switzerland is just a great place. So many friends in Switzerland. Great investors. And you have a lot of our stock in the United States. So I have helped to make Switzerland even richer, and I’m very happy about that. But the stock market is up almost 50 percent. And I will say this with great conviction, that had the opposing party won, in my opinion — because they would have added additional regulation to already the tremendous regulations we have — I believe the markets would have been down anywhere from 25 to 50 percent, instead of being up almost 50 percent. We’ve done a great job, and a lot of people are very happy about it. And in a little while, I’ll be speaking about it. But I just want to thank you for honoring us. We have tremendous respect for you — and congratulations on the election — and tremendous respect for your country. And it’s an honor to be here. Thank you. PRESIDENT BERSET: Thank you very much. The following is the speech President Donald Trump delivered at the World Economic Forum at Davos, Switzerland on Jan. 26, 2018. It’s a privilege to be here at this forum an business and science diplomacy and people from world affairs gathered for many, many years to discuss how we can to advance prosperity and peace. I'm here to represent the interests of the America people and affirm America's friendship and partnership in building a better world. Like all nations represented at this great forum, America hopes for a future which everyone can prosper and every child can grow up free from violence, poverty, and fear. Over the past year, we have made extraordinary strides in the U.S. We're lifting up forgotten communities, creating exciting new opportunities, and helping every American find their path to the American dream. The dream of a great job, a safe home and a better life for their children. After years stagnation the nights is once again experiencing strong economic growth. The stock market is smashing one record after another, and has added more than $7 trillion in new wealth since my election. Consumer confidence, business confidence, and manufacturing confidence are the highest that they have been in many decades. Since my election we've created 2.4 million jobs and that number is going up very, very substantially. Small business optimism is at an all-time high. New unemployment claims are near the lowest we've seen in almost half a century. African-American unemployment reached the lowest rate ever recorded in the United States and so has unemployment among Hispanic-Americans. The world is witnessing the resurgence of a strong and prosperous America. I'm here to deliver a simple message. There has never been a better time to hire, to build, to invest and to grow in the united States. America is open for business and we are competitive once again. The American economy is by far the largest in the world and we've just enacted the most significant tax cuts and reform in American history. We've massively cut taxes for the middle class, and small businesses to let working families keep more of their hard earned money. We lowered our corporate tax rate from 35 percent all the way down to 21 percent. As a result, millions of workers have received tax cut bonuses from their employers in amounts as large as $3,000. The tax cut bill is expected to raise the average American's household income by more than $4,000. The world's largest company, apple, announced it plans to bring $245 billion in overseas profits home to America. Their total investment into the United States economy will be more than $350 billion over the next five years. Now is the perfect time to bring your business, your jobs, and your investments to the United States. This is especially true because we have undertaken the most extensively regulatory reduction ever conceived. Regulation is stealth taxation. The U.S. Like many other countries unelected bureaucrats, we have, believe me, we have them all over the place, and they have imposed crushing and anti-business and anti-worker regulations on our citizens with no vote, no legislative debate, and no real accountability. In America those days are over. I pledged to eliminate two unnecessary regulations for everyone new regulation. We have succeeded beyond our highest expectations. Instead of two for one, we have cut 22 burdensome regulations for everyone new rule. We are freeing our businesses and workers so they can thrive and flourish as never before. We are creating an environment that attracts capital, invites investment, and rewards production. America is the place to do business, so come to America where you can innovate, create and build. I believe in America. As president of the United States I will always put America first just like the leaders of other countries should put their country first also. But America first does not mean America alone. When the United States grows, so does the world. American prosperity has created countless jobs all around the globe and the drive for excellence, creativity, and innovation in the U.S. Has led to important discoveries that help people everywhere live more prosperous and far healthier lives. As the United States pursues domestic reforms to unleash jobs and growth, we are also working to reform the international trading system so that it promotes broadly-shared prosperity and rewards to those who pray -- play by the rules. We cannot have free and open trade if some countries exploit the system at the expense of others. We support free trade but it needs to be fair and it needs to be reciprocal because in the end unfair trade undermines us all. The United States will no longer turn a blind eye to unfair economic practices including massive intellectual property theft, industrial subsidies, and pervasive state-led economic planning. These and other predatory behaviors are distorting the global markets and harming businesses and workers not just in the U.S. But around the globe. Just like we expect the leaders of other countries to protect their interests, as president of the United States, I will always protect the interests of our country, our companies, and our workers. We will enforce our trade laws and restore integrity to our trading system. Only by insisting on fair and reciprocal trade can we create a system that works not just for the U.S., but for all nations. As I have said, the United States is prepared to negotiate mutually beneficial, bilateral trade agreements with all countries. This will include the countries within TPP, which are very important. We have agreements with several of them already. We would consider negotiating with the rest either individually or perhaps as a group if it is in the interests of all. My administration is also taking swift action in other ways to restore American confidence and independent. We are lifting self-imposed restrictions on energy production to provide affordable power to our citizens and businesses and to promote energy security for our friend all around the world. No country should be held hostage to a single provider of energy. America is roaring back and now is the time to invest in the future of America. We have dramatically cut taxes it make America competitive. We are eliminating burdensome regulations at a record pace. We are reforming the bureaucracy to make it lean, responsive and accountable and we are insuring our laws are enforced fairly. We have the best colleges and universities in the world and we have the best workers in the world. Energy is an abundant and affordable. There is never been a better time to do business in America. We are also making historic investments in the American military because we cannot have prosperity without security. To make the world safer from rogue regimes, terrorism and revisionist powers, we're asking our friend and allies to invest in their own defenses and to meet their financial obligations. Our common security requires everyone to contribute their fair share. My administration is proud to have led historic efforts at the united nations security council and all around the world to unite all civilized nations in our campaign of maximum pressure to de-nuke the Korean peninsula. We continue to call on partners to confront Iran's support for terrorists and block Iran's path to a nuclear weapon. We're also working with allies and partners to destroy jihad it terrorist organizations such as ISIS and very successfully so. The nights is leading a very, very broad coalition to deny terrorists control of their territory and populations, to cut off their funding and to discredit their wicked ideology. I am pleased to the support that the coalition to defeat ISIS has retaken almost 100% of the territory once held by these killers in Iraq and Syria. There is still more fighting and worked to be done. And to consolidate our gains. We are committed to insuring that Afghanistan never again become as safe haven for terrorists who want to commit mass murder to our civilian populations. I want to thank those nations represented here today that have joined in these crucial efforts. You are not just securing your own citizens but saving lives and restoring hope for millions and millions of people. When it comes to terrorism we will do whatever is necessary to protect our nation. We will defend our citizens and our borders. We are also securing our immigration system as a matter of both national and economic security. America is a cutting-edge economy but our immigration system is stuck in the past. We must replace our current system of extended family chain migration with a merit-based system of admissions that selects new arrivals based on their ability to contribute to our economy, to support themselves financially, and to strengthen our country. In rebuilding America we are also fully committed to developing our workforce. We are lifting people from dependence to Independence because we know the single-best anti-poverty program is a very simple and very beautiful paycheck. To be successful it is not enough to invest in our economy. We must invest in our people. When people are forgotten the world becomes fractured. Only by hearing and responding to the voices of the forgotten can we create a bright future that is truly shared by all. The nation's greatness is more than the sum of its production and a nation's greatness is the sum of its citizens, the values, pride, love, devotion and character of the people who call that nation home. From my first international G-7 summit to the g20, to the U.N. General assembly, to APEC, to the world trade organization and today at the world economic forum my administration has not only been present but has driven our message that we are all stronger when free, sovereign nations cooperate towards shared goals and they cooperate toward shared dreams. Represented in this room are shared dreams. Represented in this room are some of the remarkable citizens from all over the worlds. You are national leaders, business titans, industry giants and many of the brightest mind in many fields. Each of you has the power to change hearts transform lives and shape your country's destinies. With this power comes an obligation however, a duty of loyalty to the people, workers, customers, who made you who you are. Together let us resolve it use our power, our resources and our voices, not just for ourselves but for our people, to lift their burdens, to raise their hopes and to empower their dreams. To protect their families, their communities, their histories and their futures. That's what we're doing in America, and the results are totally unmistakable. It's why new businesses and investment are flooding in. It's why our unemployment rate is the lowest it's been in so many decades. It's why America's future has negative been brighter. Today, I am inviting all of you to become part of this incredible future we are building together. Thank you to our hosts, thank you to the leaders and innovators in the audience but most importantly, thank you, to all of the hard-working men and women who do their duty each and every day, making this a better world for everyone. Together let us send our love and our gratitude to make them because they really make our countries run. They make our countries great. Thank you and god bless you all. Thank you very much. SENIOR ADMINISTRATION OFFICIAL: Good morning. Thank you for coming. I apologize that we are late. This session is on background, attributable to a senior administration official. There is no recording of this other than for notes. There’s no broadcast recording, no video, and please no stills. And with that said, [senior administration official], would you like to start? SENIOR ADMINISTRATION OFFICIAL: Sure. Good morning. It’s good to be with all of you. The President looks forward to addressing the forum later this afternoon and talking about America and the world, and in particular, America’s place in the world and America’s role in the world. I think you can expect to hear the President talk about, broadly speaking, three themes in this speech. The first is that America is open for business again, in the sense that there’s been no better time to build, to invest, to hire in the United States. And you can expect him to talk about some of the policy priorities and accomplishments of his administration thus far, and the policy orientation designed to help unleash economic growth and create a very business-friendly climate. So the significant tax cuts and tax reform, especially on the business and international sides; his very successful efforts thus far at regulatory reform and relief, seeking to roll back burdensome regulations and create a more business-friendly environment; efforts at boosting energy production and keeping energy costs low. And you can also expect the President to tout many of the economic successes of the United States; many of the leading economic indicators that attest to the United States being a very business-friendly environment — the GDP growth, stock market records, unemployment, and job creation. The second theme that I think that you will hear the President speak to relates to America’s engagement in the world. So a vision for U.S. participation in the global economic order, but on terms that are fair and equitable. So an example would be United States engagement in the international trading system; a commitment to free and open trade, but on terms that are fair and reciprocal; commitment to trade enforcement, enforcing trade agreements and trade laws and trade norms; no longer tolerating things like the theft of intellectual property or forced technology transfers, industrial subsidies, state economic planning, dumping, those sorts of things. But in the context that it’s only by enforcing the rules of the road and ensuring that all countries play by the rules — the rules of international trade — that we can preserve and maintain the integrity of the international trading system. So very much that trade enforcement — meaningful, rigorous, fair trade enforcement — is a way of supporting the global trading system. As well as on the security side, I think you’ll hear him call on the international community to work together towards a variety of shared goals, things like defeating ISIS, applying maximum pressure to denuclearize the Korean Peninsula, combatting terrorism in all of its forms and varieties. And finally, I think you’ll hear the President articulate a vision of free and sovereign nations cooperating towards shared goals — peace, security, prosperity, and in particular, given the theme of this year’s forum, empowerment, lifting up and empowering the forgotten men and women in the United States and throughout the world. So with that as, sort of, a thematic backdrop of what you can expect to hear the President speak to this afternoon, I’m happy to take your questions. SENIOR ADMINISTRATION OFFICIAL: All right, when you ask a question, I’ll call on you. Please say your name and the media outlet. Ma’am. Q (Inaudible) from CNN. Did the President order Robert Mueller to be fired? SENIOR ADMINISTRATION OFFICIAL: You know, that’s beyond the scope of the themes of the speech, and not something that I care to discuss in this forum. Thanks, though. SENIOR ADMINISTRATION OFFICIAL: Whether or not the President ordered the firing of Robert Mueller. SENIOR ADMINISTRATION OFFICIAL: Okay, in the back there, in the middle. There’s a microphone right there. Q Sorry. Peter Baker, New York Times. The President yesterday, in his interview with CNBC, suggested that he was open to rethinking the TPP decision of a year ago. A, will he walk about that in his speech? And B, what would actually cause him to do that? Is there any actual process that would be initiated to do that, or is this just sort of a random thing he says in an interview that wouldn’t actually lead to something? SENIOR ADMINISTRATION OFFICIAL: Sure. So you can certainly expect the President to talk about trade in this speech as part of engagement with the world and with the global economic order. The President has, over the course of a series of speeches, many of them given during his international travel — the most recent in Danang, Vietnam — has talked about an openness and a desire to engage, in particular, on bilateral trade negotiations, trade agreements. He’s indicated an eagerness to negotiate additional free trade agreements, and even a willingness to engage in the multilateral trade system in general. So I think that those are some of the things that motivated his comments about TPP. I think that you can expect in his speech for him to speak broadly about what the principles of U.S. engagement would be, and potentially mention some specifics that could include TPP. But a real desire to continue to have America as a leader in free and open trade, but, again, as a leader in ensuring that all nations play by the rules and that trade laws and trade agreements are enforced, such that people can count on the global trading system, and that its integrity can be preserved such that people the people have confidence in it and that all share in the rewards and the upshots of the trading system as well. SENIOR ADMINISTRATION OFFICIAL: And, Peter, I would just say one thing in addition, which is, he didn’t indicate that he’s rethinking his decision of last year. His decision of last year is — really, his campaign promise was not to be in the TPP as it exists. He stands by that decision. He doesn’t think it was a good deal for the United States as it exists. What he indicated in the interview is a willingness to perhaps enter a similar trade arrangement with the same nations on different terms, if those terms are fundamentally more favorable to the United States. Q Will there be follow-through or was that just a general statement? SENIOR ADMINISTRATION OFFICIAL: There will be follow-through. But again, as there’s follow-through on his trade agenda broadly, the USTR is constantly talking to other countries about ways to expand trade in ways that are free and fair and reciprocal, including the renegotiation of existing deals and, perhaps, the renegotiation of deals that haven’t yet been enacted. But the decision that he made was based on what had been negotiated before he came into office, and he absolutely stands by that. He thought that was a bad deal, and he still thinks that was a bad deal. Q (Inaudible) with Televisa Mexico. Will the President present his vision on the broad structure of NAFTA 2.0? SENIOR ADMINISTRATION OFFICIAL: This is not designed to be a trade speech in particular; more touching on sort of broad themes of U.S. engagement in the world, and certainly in, sort of, the global economic system. He will talk about principles of trade, but I think it unlikely to — he’s unlikely to have time to get down into a great deal of specificity of any particular trade arrangement or trade agreement or trade enforcement action. SENIOR ADMINISTRATION OFFICIAL: I would just add to that, especially since the negotiation is ongoing between the United States, Mexico, and Canada. And I don’t think — the President would be one of the first to tell you that he doesn’t negotiate things like that in public. These talks are private at the moment, and the United States Trade Representative, along with senior officials from Canada and Mexico, are still talking. And so he’s going to continue those talks in private and see what can be accomplished. Q Gideon Rachman from the Financial Times. Talking to Cecilia Malmström yesterday, who’s the EU’s lead person on trade, she responded to Wilbur Ross’s comments about a trade war already being underway, and said talk of a trade war was irresponsible. She also said that the EU is extremely alarmed by the way the Trump administration is blocking the appointment of new judges at the World Trade Organization. Given what you just said about the President’s preference for bilateralism in trade rather than multilateralism, I mean, are the EU right to be alarmed? Is the WTO something that you’re downgrading, really, in your view of how global trade works? SENIOR ADMINISTRATION OFFICIAL: Well, look, as I said before, the President is very committed to ensuring that all nations and all participants in the global trading system play by the same set of rules so that the prosperity that’s generated can be broadly and fairly shared, a commitment to fairness and reciprocity. There are a variety of ways in which those principles are enforced. Some of them relate to domestic law and to various enforcement actions that have been taken. Some relate to negotiations between countries. And some relate to various enforcement actions at bodies like the WTO. I think the President is very much committed to ensuring that, in all of those trade relationships and all of those trading arrangements, that they are free and are open but also conducted on the basis of fairness and reciprocity. And sometimes that can include having to reform some of the ways in which trade agreements and trade arrangements are enforced. But I don’t expect that you will hear in this speech today a great deal of detail about particular WTO actions or WTO reforms, although that remains a priority for Ambassador Lighthizer. It’s something that he has spoken to in the past and continues to be engaged in presently. Q Thanks so much. Joe Hayes from ITV News. Which nations aren’t playing by the rules? And will President Trump be naming them? SENIOR ADMINISTRATION OFFICIAL: You know, in such a brief speech, I don’t think that you’re likely to hear the President name individual nations — particular nations — in a speech such as this. You know, I think that you’re likely to see — you have already, in some of the actions that Ambassador Lighthizer has taken, in some of the anti-dumping countervailing duty cases that have been brought through the department of Commerce, and a whole variety of trade enforcement actions that have taken place and that may take place in the future — that you’ll see examples of areas of countries, of particular products where there’s a sense that there are unfair trade practices. And that’s likely to be, sort of, the venue and the forum in which you would see sort of a nation-by-nation or product line-by product-line type analysis. Unlikely to see a whole lot of that in a 10- or 15-minute speech here at the WEF. SENIOR ADMINISTRATION: I would just add to that. The President hasn’t been shy about stating his views on which countries and which specific practices he objects to, both as a candidate and as President. And he’s even done so in specific countries, in specific meetings with specific leaders, on the record, on camera. So he’s been quite clear about this, and I agree with my colleague that this is not a speech to necessarily name names. It’s to lay out broad principles. And it’s fundamentally an optimistic speech that tells people the story of the U.S. economy in 2017 and his hopes for the U.S. economy in 2018 and 2019, going forward, and that this is a great time to invest in America, but that trade needs to be conducted on a — I was going to say on a fundamentally different basis, but that’s not really right. On a — according to rules that we’ve all agreed to that maybe have been unevenly enforced, but that he’s saying that the period of, sort of, toleration for that on the part of the United States is over with the advent of a new administration. Q Hi, Miriam Elder from Buzzfeed News. In light of the New York Times report that President Trump was prepared to fire Mueller, do you still feel confident serving this administration? And how do you address concerns that that report will likely overshadow what by all accounts sounds like an optimistic speech? SENIOR ADMINISTRATION OFFICIAL: I feel 100 percent confident serving this administration. Q Hi, Jen Rogers, Yahoo Finance. Do you think we can hear anything on immigration or border security? SENIOR ADMINISTRATION OFFICIAL: No, I think the President will touch on a whole range of international affairs and, sort of, homeland security issues. I think he may well touch on immigration in, sort of, the context of describing some of the objectives of immigration systems, some of the shared goals, and some of the ways in which that affects international relationships. But that is not necessarily going to be a primary theme of the speech or a topic, given how brief the speech is, and given, sort of, the nature of the audience of the forum and of the themes that’s we’ve talked about — talking about America’s economic reconnaissance of now being a good time to do business in the United States and of really, sort of, laying out even more of a vision for the United States engagement in the world, economically and otherwise. Immigration, obviously, plays a role in that, and I think you can expect a mention, but this is not primarily a speech about immigration. Q Hi, thanks so much. It’s Heather Timmons from Quartz. A number of CEOs from African nations I’ve talked to have said they’re considering boycotting this speech, or they may walk out in the middle of it. Can you tell us what the President is going to say today to the President of Rwanda? And is he going to apologize? And if so, what for? SENIOR ADMINISTRATION OFFICIAL: There’s a lot of common interests between the United States and Africa. This is — in a way, it’s a follow-up to a lunch the President held in the United Nations General Assembly week in September with a number of African heads of government and heads of state. So there’s areas of security cooperation that the United States and African leaders — and remember that the President of Rwanda is the head of the African Union now. There’s areas of security cooperation that they’ll talk about, trade cooperation, economic development, various other — not in security, not just in terms of terrorism, although that’s an issue, but there are health issues and a pretty wide range of issues that they’ll talk about to build on a strong relationship the United States has had with African nations for many years, and that this administration has tried to move forward, again, through the U.N. luncheon and through other venues. So this is part of keeping that agenda strong and moving forward. Q A follow-up question to that. Michelle Caruso-Cabrera from CNBC. Is the President aware that some of these African CEOs are threatening a boycott or threatening to walk out? SENIOR ADMINISTRATION OFFICIAL: It’s not something I’ve heard him talk about. I think he’s focused on giving a great speech. He’s happy with the reception he’s had at the World Economic Forum. He’s, really, very pleased with the reception he’s had. He came with a strong message that America is open for business. And he looks forward to repeating that business in the highest-profile venue of the forum for him, which is a speech to leaders. And so he’s going to do that. It’s a great, sort of, capstone and high point, right as he returns to the United States. It will be his last event here. Q Hi, Luciana Coehlo with (inaudible) Sao Paulo, Brazil. Some foreign officials have said that President Trump may leave the door open to rejoin the Paris Agreement, in the speech. Is that so? SENIOR ADMINISTRATION OFFICIAL: Well, you don’t need foreign officials to tell you that he’s left the door open to rejoin the Paris Agreement because the President himself has said that he’s open to rejoining the Paris Agreement. And, in fact, he said it in the very speech in which he announced, initially, the U.S. withdrawal from the Paris Agreement. So it’s something that he’s still open to. Again, the same point I would make about this, I already made about the TPP: He’s open to rejoining, if the terms are different and if the terms are better for the United States. You will later today — I think they’ve already started to preview it in an interview that he did with Piers Morgan, with CNN International. And this very question he was asked, and he spoke at length about the United States’ environmental record and about his administration’s agenda for environmental protection, including water and clean air and conservation, all of which he feels very strongly about. He just thought that the Paris Agreement, as drafted and as entered into by the previous administration, put too many constraints on the U.S. economy and put the U.S. economy at a vast disadvantage to other economies. So his objection to the Paris Agreement was not in any way related to its goals of environmental protection; it was the way that it enacted environmental restrictions and the way that it restricted the U.S. economy vis-à-vis other countries. And if that can be fixed, he said six months ago, he’s open to rejoining, or to joining a new agreement. Q Will there be a specific mention? SENIOR ADMINISTRATION OFFICIAL: I don’t think that’s likely to come up as part of the speech, although there are any number of topics that he could mention and discuss. But again, the focus is going to be on the United States and its approach, its posture towards, and its involvement in, the international community and, in particular, sort of, the global economic community. And that will be the primary theme. Q Thank you. (Inaudible), Bloomberg News. How do you explain the apparent difference in opinion between the President and his Treasury Secretary in their view of the U.S. dollar? It cost a lot of volatility in markets over the last 48 hours. SENIOR ADMINISTRATION OFFICIAL: I don’t think there’s any daylight between the President and Secretary Mnuchin. I think that there were some people who took some comments that the Secretary made, where he was essentially reciting and explaining, in a descriptive manner, a basic economic principle, and took it to represent some sort of normative judgment or some sort of policy announcement or shift. When you go back and look at the transcript of what he said, it was quite clear that that was not the case. And I think that’s been borne out in all of the successive comments that he’s made and the President has made. SENIOR ADMINISTRATION OFFICIAL: Okay, thank you very much. Have a good day.